With the evolution of cloud platforms in recent years, I find that companies are now more seriously considering relocating their on-premises IT infrastructure into public or private cloud in order to realise operational efficiency and cost benefits. A key part of such an infrastructure is likely to be the company file system. On the face of it, this may seem like a very simple infrastructure component to migrate but there are some key areas that should be considered and planned prior to undertaking the migration. Essentially, you have the choice of public or private cloud. You would likely want to consider ongoing running costs and security features of each cloud-based solution. Beware of some cloud-based solutions that will charge for not only storing data but its transfer as well – they could lead to very high ongoing costs. Consider enhancing access security with multi-factor authentication – after all, your company files are likely to contain confidential/sensitive information. 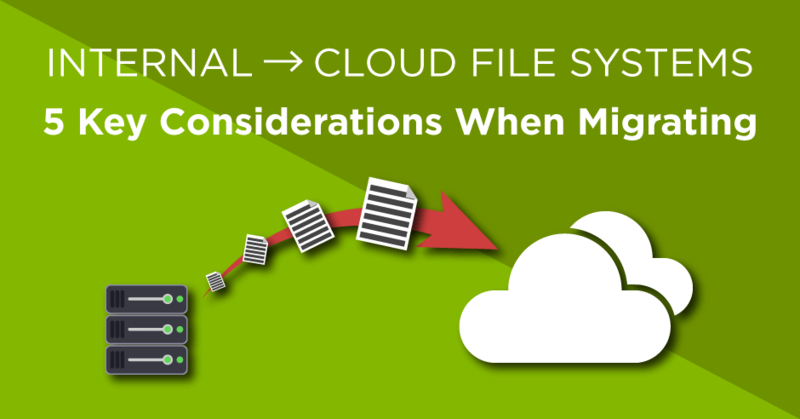 Also, be mindful of the limitations of the cloud solution – for example, file permissions from the source system may not be maintained or files stored in a long nested path/with long file names could be problematic during a migration process. If you are predominantly working with large files then you may find that only moving your files into a cloud-based solution could cause operational difficulties due to the slow opening of remote files. This would in part be down to your available internet bandwidth. Typically, standard office files work well when accessed from remote cloud storage environments but larger files (videos etc) may require additional cloud service features such as streaming, to make access to them efficient. Since file systems are core to most businesses, it is likely that there will be other internal (and possibly external) business systems and processes that interact with the current file system. These should be assessed to determine how the file storage system could be migrated into a cloud-based solution without negative impact on other internal systems and processes. A cloud-based storage solution probably makes file access more flexible in terms of not being tied to specific locations when accessing the files but it also may change the way that staff have to access the files. For example, staff may be used to accessing files via a mapped drive and a cloud-based solution may be web browser based. Carefully consider how this could affect operational efficiency as staff learn a new way of working. Most businesses have an operational reliance on their file system. If you migrate these services into the cloud, then it’s important to consider things like office Internet connectivity resiliency and how the cloud-based file system can be backed up / recovered in the event of a disaster along with what inbuilt resilience the cloud solution offering may have. This will help to ensure minimum business disruption. With careful solution selection, planning and preparation before implementation – a migration of file storage systems to a cloud-based solution should provide optimum cost and operational efficiency benefits with minimum business impact.